The Presbyterian Church of Morris Plains began in 1874. The first church served the community until 1923 when the church decided to move to a new location on the Main Street of the town. The congregation rolled the old building to its new site and one of the organizers of this historic event’s grandson is still an active member today. As the church grew in the 1950’s the new church was built and dedicated in1954. The education wing was added in the 1960’s and the building has been serving this community fully since that time. The church today seeks to still serve the community. The church is the home for Joyful Noise Nursery School which provides daycare and nursery school services with a Christian Perspective to hundreds of local preschoolers. The Red Cross provides a monthly blood drive. A Memory Cafe ministry seeks to provide a place of stimulation and support for local families living with dementia. The congregation seeks opportunities to connect with community. Recently the congregation elected a Pastor Nominating Committee and are actively seeking to new pastor. Rev. Jacqui Van Vliet serves as their interim pastor. Let us remember the Presbyterian Church of Morris Plains as they continue to serve the community and follow the lead of the Holy Spirit to a new spiritual leader. 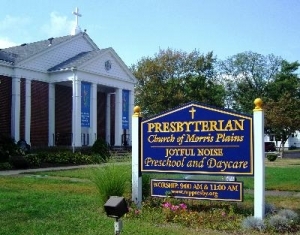 We give you thanks for the decades of ministry of the Presbyterian Church of Morris Plains. Let your Spirit continue to guide and inspire them on their journey. We know you have a person ready to lead this congregation. Guide the PNC to the person that will lead and walk along side them into the next chapter in their ministry for the Kingdom of God.